What is the German Beer Purity Law and is it still obeyed? The Germans are so serious about their beer they made a stamp! What are the German Beer Purity Laws? Have you ever been drinking a commercially brewer German beer, been bored with the conversation and decided to read the bottle label? Did you spy the wording 'brewed according to the German Beer Purity Law'? Did you wonder what the law meant? If you thought it meant your beer was brewed by beautiful virgins with long blonde hair, you're probably on the wrong website. The German (read that as Bavarian) beer purity laws showed just how serious they were (and still) are about brewing their beer. Introduced by Bavarian officials in 1516, the 'Reinheitsgebot' (as it eventually became known 300 years later) was designed to try and control price competition in the market place. German economists, not understanding the complex dynamic of market pricing required that only barely could be used in beer brewing so as to not increase the price of other produce that could be used to make bread, namely rye and wheat. According to the Bavarian law, the only ingredients that could be used in the production of beer were water, barley and hops. And that's it. Note that yeast is not mentioned. This came much later in the 19th century when it was realised that yeast was pretty vital when making beer! The 'Reinheitsgebot law' also made rules about the price that beer could be sold as in the bars. This pricing strategy was intended to reduced competition for the ingredients that went into bread being rye and wheat. By making the law, the effect was to exclude beer from the wider German states that may have contained other ingredients thus helping reduce competition and allow local Bavarian beer producers to continue as they were. 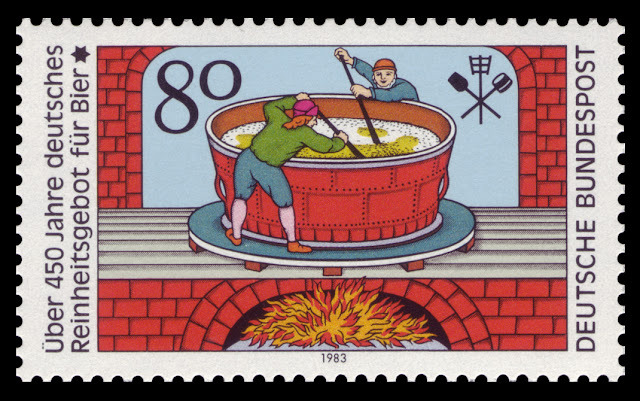 To keep in line with the beer law, making pilsner beers became the order of the day, thus laying the foundation for German's proud history of making pilsner. It’s often claimed that the beer purity law was the first food safety legislation in the world. This is because the law prevented brewers from adding ingredients that could be considered unhealthy such as rushes, roots, mushrooms, and animal products. The mushrooms could have some severe consequences for the drinker as the point of imbibing was to a) enjoy a beer and b) enjoy the effect of alcohol and not experience a hallucinogenic experience caused by the mushrooms! It’s mused that the original intent of the law did not really entertain health concerns but it’s focus was ensuring profits for local Bavarian brewers by keeping out competitive beer makers. So is the beer purity law still observed? This law was taken very seriously and was observed for 300 years. Eventually, it spread across the whole of Germany. Yeast was later added to the law when it was identified how vital it was in the beer making process. When Bavaria entered the German Unification of 1871, it was a condition of their entry that the beer law was carried through. Not even ruler such as Adolf Hitler and the Third Reich dared change the way beer was made. Even in the more modern era, the law is still strictly applied and this had led to various court cases taken by brewers who want to try new ingredients and brewing processes. This has led to several products being made that are beers but cannot have the word 'bier' on their label and also variations on malt and production techniques may be used. Faced with the reality international trading obligations, Germany allows the importation of beer that does not comply with the local legislation, however local brewers must still observe the requirements. They are however, less stringent that they used to be! The reality of the modern world is that there is no reason to have a beer purity law - local and international competition sort all that out, especially when there is greater supply of product like wheat and rye around the world - so the consumption of beer doesn't effect the price of bread! Instead, a passionate beer fraternity still follow the methods for reasons of tradition and more arguably, for a competitive marketing benefit! Now-a-days, beer brands like Heineken use the reference to the purity law as a means to identify with quality and to align their beer with good bear making ideals - thus giving comfort to the beer drinker they are drinking a quality product. It's quite a good tactic given that beer is a global product and traded freely around the world. German beer can be held out as being brewed in a certain way and without ingredients that the health (!) conscious beer drinker may be keen to avoid.